You can’t find too much of it in New York, but I absolutely love South Indian cuisine. 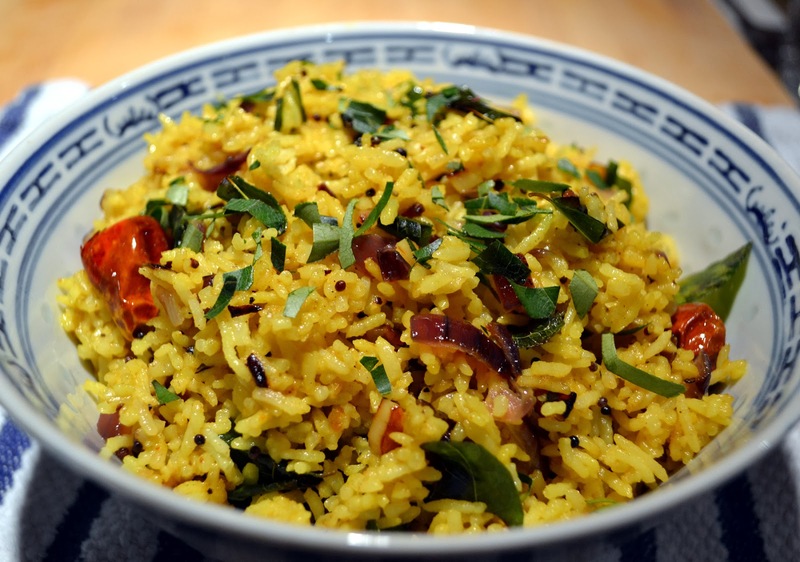 Speaking very generally, South Indian food is lighter and drier than the rich, creamy curries from the North that are more commonly found in our Indian restaurants. 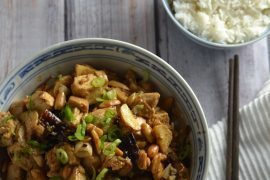 They rely heavily on coconut, which grows there in abundance, as well as on ingredients like turmeric, mustard seeds, chilies, tamarind, and curry leaves. Curry leaves are my absolute favorite South Indian ingredient and, indeed, one of my favorite ingredients in the world. Although they are largely unfamiliar to us in the United States, both fresh and dried curry leaves are available here in Indian stores. They have an incomparable grassy, citrusy, herbaceous flavor that really can’t be described adequately in words. Earlier this week, I decided to improvise with some leftover rice. (Never throw out leftover rice!) To make it taste South Indian, I knew I’d be in good shape if I cooked it with mustard seeds, coconut, and curry leaves. I threw in some chilies and turmeric for good measure. It made for a great change of pace from my usual fried rice. 1. Get all the ingredients ready. Slice the onion and garlic. Coarsely chop the curry leaves. Open the coconut milk. 2. Heat a wok or large nonstick pan over medium-high heat. When it is hot, add the oil and the chilies. After a minute, add the mustard seeds. When the mustard seeds start spluttering, add the curry leaves and the onions. Cook, stirring frequently, until the onions soften, about 3 minutes. Add the garlic and cook for a minute more. 3. Add the rice to the pan and gently break up any clumps with a spatula or spoon. Cook for a few minutes, stirring only once in a while, to give the rice a nice sear. Add the turmeric and continue cooking, stirring to coat all the rice. Season with salt and pepper. 4. Add the coconut milk to the pan. Let the coconut milk reduce, stirring to coat all the rice. After a minute or two, remove the rice to a serving bowl. 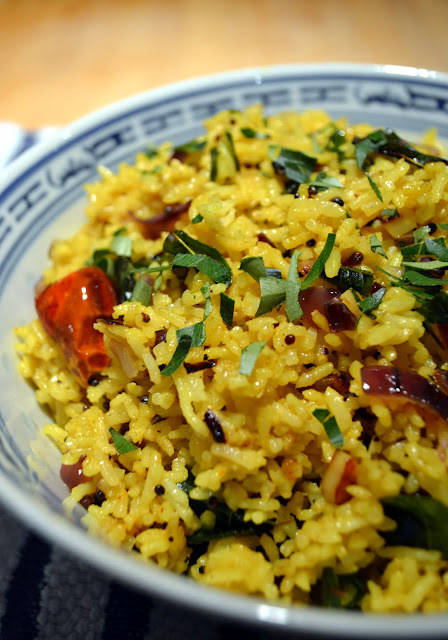 Top with some thinly sliced curry leaves or fresh herbs. 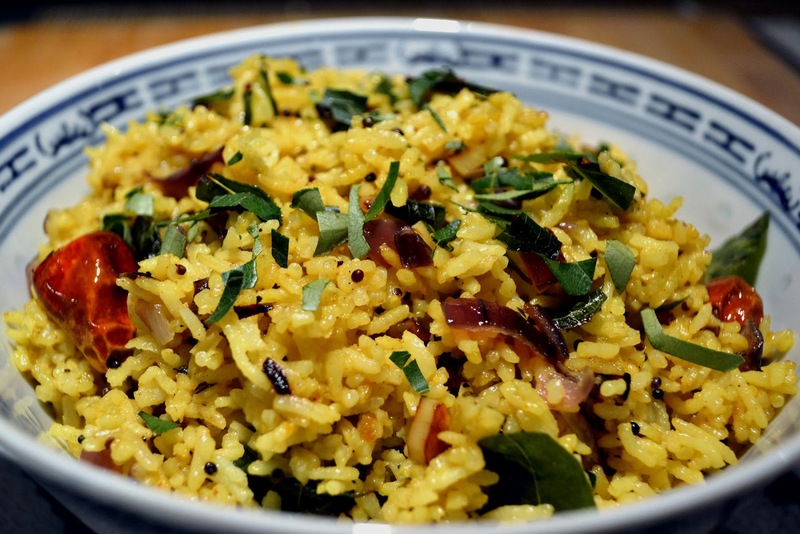 This dish is partly inspired by the coconut shrimp biryaani served at Devi on 18th Street, which is a rice dish that is also made with mustard seeds, curry leaves, and coconut. Devi has been one of my favorite Indian restaurants in the city, although it recently went downhill after losing its star chef. Wow. That looks so delicious. I'd never heard of a curry leaf before. Thanks for including the links. This kind of dish is right up my alley. Thanks Amanda! Curry leaves are life changing. Check out the Spice Corner next time you're in Curry Hill, up the block from Kalustyan's – the guy who works there is so friendly, he always sends me home with free dessert. Thank you. I’ve tried it and it’s now my go-to recipe.